an officer of the Soviet Army staff. In 1926 he became a member of the Communist Party of the Soviet Union. He graduated from the Military-Political Courses named after F. Engels and later (1933) the Military-Political Academy in Moscow named after V.I. Lenin. 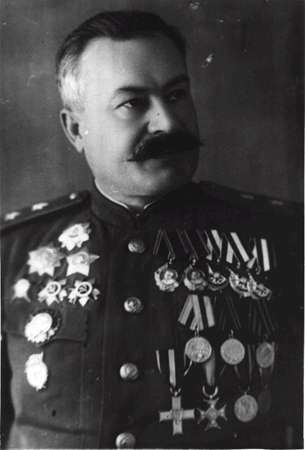 Before 1941 he was a political instructor of a training battery, military commissar [commanding officer] of a division, military commissar of a regiment, head of a political department of a brigade, military commissar of a mechanized corps, military commissar of the First Leningrad Artillery School. During the Great Patriotic War (1941-1945) he participated actively in the battles against german-nazi troops. In summer 1941 he was the military commissar of the 8th mechanized corps of the Soviet Army. In the beginning of the War he placed himself at the head of the troops of the corps performing successfully the counter-stroke in the region Lutsk-Brody-Rovno (the Western Ukraine) which provided the one-week delay in the enemy progress. After the counter-stroke his troops were encircled. He withdrew out of encirclement about two thousand troops. They moved about 650 km behind the enemy lines. Later he was the Member of the Military Council of the 38th, 21th, 28th Armies as well as of the 1st Guard's Armoured Army. Being on the staff of the 1st Guard's Armoured Army he participated in the Kursk battle, in the liberation of Ukraine and Poland and in the battle of Berlin. After 1945 N.K. Popel worked as the Deputy Commander of Armoured Forces in Byelorussian Army Group, the Deputy Head of the Main Administration of the Selfpropelled Armoured Vehicles of the Soviet Army, the member of the Military Council of Armoured Forces of the Soviet Army. He was awarded following Soviet orders: two Orders of Lenin, three Orders of Red Banner, the Orders of Kutuzov (I class), Suvorov (II class), Bogdan Khmelnitsky (II class), two Orders of the Great Patriotic War (I class), the Order of Red Star, as well as many medals. Among the foreign awards he had the Order of Suhe-Bator (Mongolia), the Gruenwald Cross (Poland), the Order of the Virtuti Militari (Poland), the Medal for the Liberation of Poland, etc. N.K. Popel authored following books: "In Hard Time", "Tanks Turned Toward the West", "Berlin is Ahead", "Brigade 'Revolutionary Mongolia'", "The Heros of the Kursk Battle", "Immortal Battery of Alikhan Gagkaev", "Hatches were Opened in Berlin", etc. His books were translated to Polish, German, Ukrainian, Czech, Serbo-Croatian languages. In the books in Polish the following version of spelling of his name is used: Mikolaj Popiel, in German: Nikolai Popjel. Married with E.N. Lenova, N.K. Popel had two daughters. One of them, A.N. Popel, lives now in Moscow. One of the streets in Nikolaev is named in his honour. He died on February 25, 1980 in Moscow. 1) G.K. Zhukov, "Reminiscences and Reflections" (in Russian), Agenstvo Pechati Novosti, Moscow, 1988. 2) M.E. Katukov, "On the Edge of the Main Stroke" (in Russian), Vysshaja Shkola, Moscow, 1985. 3) A.A. Epishev et al., "N.K. Popel", Krasnaya Zvezda, 28.02.1980, No. 49 (17136) (in Russian). 4) Prikaz 270 Stavki Verkhovnogo Glavnokomandujushchego Krasnoi Armii ot 16 Avgusta 1941 g. (The Order 270 of the Headquarters of the Supreme Commander-in-Chief of the Red Army of August 16, 1941). 5) The movie "Battle for Moscow" (Mosfilm, USSR, 1984).